Early Chinese physicians discovered there is an energy network traversing just below the suface of the skin which communicates from the exterior to the internal organs and structures at over 1,000 “Acupoints” on the body. This energy works with the body’s circulatory, nervous, muscular, digestive genitourinary and all other systems of the body. When this vital energy becomes blocked or weakened, it can alter the entire system, producing pain or symptoms in the body. Stimulation of one or a combination of key “Acupoints” on the body may restore harmony to the affected area. This stimulation occurs when very slender needles are placed in the skin at various locations. The number of treatments vary with different conditions and individuals. Researchers internationally agree the usual number of treatments is between eight and sixteen with frequency between two and four times a week. There are many conditions that Acupuncture has been proven effective in treating. The following list includes the most commonly treated conditions. One would assume inserting a needle into the skin would be painful since most of us can relate to being stuck with a pin or having a hypodermic injection. However, because of the extreme slenderness of the Acupuncture needle, most people compare the sensation to “less than a mosquito bite.” A phenomenon referred to as “TEHCHI” occurs when the energy is contacted. This sensation is felt as a mild to moderate heaviness or tingling. Your first visit will include an initial evaluation where the doctor will use an Electro Meridian Imaging machine (EMI) along with traditional Chinese diagnostic techniques such as pulse evaluation to determine the proper diagnosis. Once the doctor completes his evaluation, he will begin placing needles in the appropriate points on your body. You will be left to relax for 20 – 30 minutes with the needles in place. Our Acupuncture room is equipped with meditation music, but you are welcome to bring your own music if you’d like. An initial Acupuncture diagnosis and treatment costs approximately $115. All following visits will cost approximately $60. 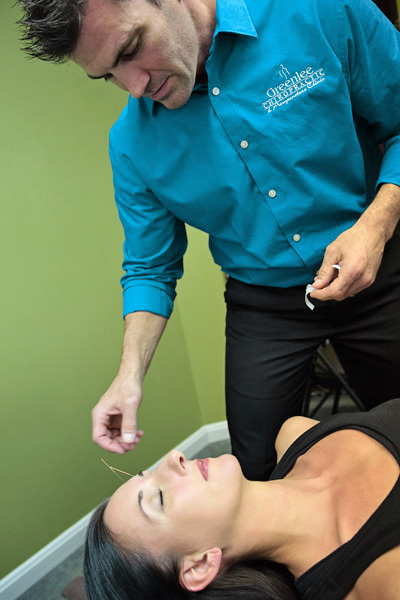 Some insurance companies now cover Acupuncture treatments for a variety of conditions. Check with your insurance company for your specific plan details.